Our 2019 Sacred Selections Auburn Dinner and Auction will benefit four Auburn Alumni with their adoption expenses. Doors will open at 5 p.m. for silent auction viewing with great donations from local businesses. The event will begin at 6 p.m. with a dessert dash followed by a buffet-style dinner, catered by Ursula's Catering. Talented pianist Anthony Sanderson will be playing throughout the evening. 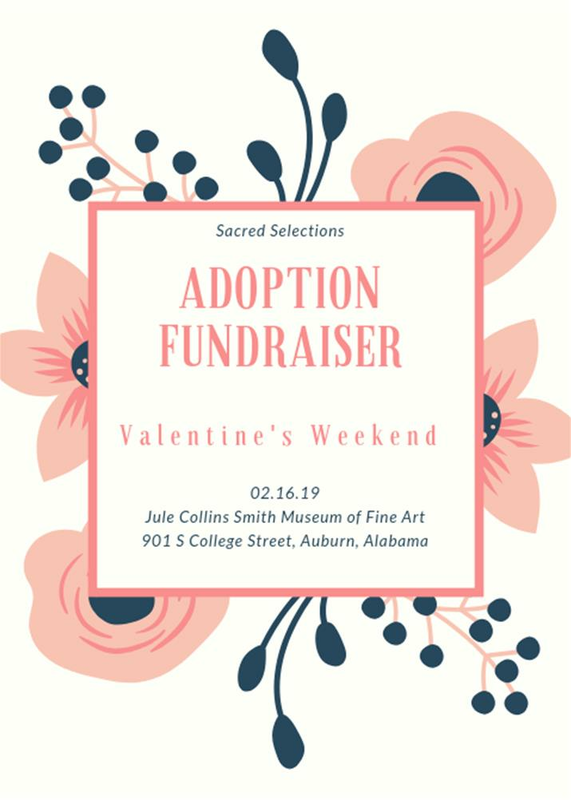 Sacred Selections founders David and Dana Carrozza will give a presentation and the event will conclude with a live auction and auctioneer Logan Thomas, featuring some very exciting items! 100 percent of the proceeds will go towards the families adoption costs - don't miss out on this opportunity to support families who chose adoption!